Review Summary: [I]The Ten Summoners’ Tales[/I] is more than a worthy listen and is an absolute must have for any music fan. It is after all good music and parades as nothing but; my favorite representative of an artist in a good place in life and music. Quick. Name one rock band from whose ashes arose a pop icon and superstar, making himself a household name over the 80s and the 90s. More likely than not you’ll think of Sting and his band The Police despite the fact that probably a faster answer should have been Genesis, for after all, it gave rise to not one but two superstars in both Peter Gabriel and Phil Collins. That’s how big this man named Gordon Matthew Sumner is. So what made him such a big name in the pop scene" Quality music. Stunned" I’ll say it again: Quality music. Sting’s music is a varied blend of a world of musical influences while principally being some concoction of jazz, lounge and rock, all in different proportions naturally. His first solo appearance was made inadvertently in 1981 performing on all four nights of the fourth Amnesty International benefit The Secret Policeman's Other Ball at the invitation of producer Martin Lewis and as they say so often, the rest is history. Zip forward 12 years to 1993. Musically and otherwise, there couldn’t be a better place to be in. With the success (both critical and commercial) of his heavily personal album, The Soul Cages, dedicated to his then recently deceased father, getting married to sweetheart Trudie Styler and also receiving an honorary doctorate from the Northumbia University, more than understandably, Sting was …. well……. happy. That was when he went into recording his next album. So what kind of record could we expect from a happy Sting. Well… a happy one. 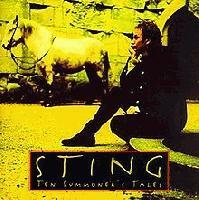 Considering he was emotionally spent after pouring out his heart in the previous record and generally having things going for him, could we expect any different" So here we have Sting’s most unabashedly pop album. No greater meaning we’re supposed to have an epiphany about, no music that’s heavily emotion laden (well that’s not exactly true but at least it’s not as heavy as the previous one. ); just a collection of good songs, fun songs and most importantly quality songs. And the music. Ah the music. With the aforementioned concoction of jazz, lounge and rock running amuck through the album, many other varied styles keep peeping out from nowhere and surprise you, so that just when you think you’ve got an idea of how the album sounds like, you’re stumbling in the dark again. One recurring musical style that tends to dominate this “Other Styles” category is country music making its appearance on multiple tracks and most prominently on Love Is Stronger Than Justice, which with its shifts between 8/8 and 7/8 time signatures keeps the track oscillating between a very rural sounding country chorus and a more sophisticated blues oriented verse. But the album’s description would be incomplete without talking about the rest of the band. The musicians list on the album boasts of some very fine musicians, with worthy mentions being Vinnie Colaiuta on drums, Dominic Miller on guitars and David Sancious (who used to play with Springsteen). No wonder then that his backing sounds….. seasoned and refined. There’s no better way to describe it. Even in the simplest of progressions, they manage to add a touch of superiority, of … should I say… magic, a case in point being the opening track. Brilliance in simplicity. Overall The Ten Summoners’ Tales is more than a worthy listen and is an absolute must have for any music fan. It is after all good music and parades as nothing but; my favorite representative of an artist in a good place in life and music. Sting’s good life, it seems, wasn’t in a hurry to turn it’s back on him. A pretty good review. I had been meaning to get this CD, if for nothing other than the beautiful "Fields of Gold." I'm very happy someone finally reviewed it. It wasn't even in Sputnik's library a year ago when I added it. I've been meaning to review either this or the soul cages ever since, but never got around to it. I love this album, it really takes me back to childhood haha. The keyboards and synths are gorgeous yet not over-done. Brilliant album. I'd get this just to hear Vinnie on Seven Days. He's so awesome on that song! Unquestionably Sting's best post-Police record, and he'll probably never top it. To think he gave up the opportunity for a new Police record to continue putting out his usual substandard crap blows my mind tbh. Fields of Gold is almost a perfect ballad. Have to agree with StrizzMatik. This is Sting's strongest record. Everything released before this was good as well, but with some filler. The soft rock crap he releases now is so lame. I can pick maybe 1-2 listenable songs on the albums that follow this one. His live performances are spot on as long as the band is playing the good tunes. Fields of Gold is one of my favorite songs ever. I could dance to that at my wedding. This album is pop/rock perfection. Not a single bad song on this collection of beautiful and complex music. Sting, you genius!